Engagement season is here and the first thing we want to do after getting engaged is to start planning. Well, all you newly engaged brides are in luck. There are wonderful bridal shows gearing back up in January. Before you head off to your first show, be sure to get organized with this bridal show checklist, so that you make the most of your time and have fun! The number of vendors at each show can vary depending on the type of show you plan to attend. Boutique bridal shows like the SoHo Bridal Show feature about 60 vendors for a more intimate feel. While shows like the Southern Bridal Show, at your local convention center aren’t as intimate, they do offer a larger selection of wedding professionals in one setting. Choose one or all, after all, they are a lot of fun! This bridal show checklist will save you time and help enjoy your time at each show. So be sure to have these key tricks up your sleeve. Some shows offer printed name labels for each bride that has pre-registered. These should include key information that many wedding professional will ask for when you visit their booth. You can use these pre-made labels to speed up your visit to each booth and also save you from writing your information down, over and over again; to enter door prizes or request more information. If you aren’t able to pre-register or if you aren’t sure you will receive labels, print a sheet at home. – name, phone number, email, event date and venue if you have already booked. You will receive business cards, brochures, samples and goodies at all of the booths you visit. Be sure to have a bag to store all of these items, so that your hands are free to taste food and flip thru sample books. Like the labels, some shows offer a free reusable bag if you pre-register. Check the registration page for each show you plan to attend to double check if these items are offered. You will talk to a lot of people and hear a lot of information in the span of a few hours. When you get home, there is no way that you will remember who told you what! Be sure to take a small note book or loose leaf paper, pen and maybe even a small stapler or paper clips. Take notes and keep those notes together with all the information, notes, brochures and business cards, so that you can return to those wedding professionals you like best, later on. If your time is limited or you only need to book a few more wedding professionals, make a list so that you don’t forget who you really wanted to speak with. You should receive a map of the show so that you can go straight to the vendors that you know you want to see before you walk around and see what everyone else has to offer. Some people will be offering discounts for booking an appointment or putting your deposit down at the show. Make sure you pack your checkbook just in case you fall in love with certain vendors. Sign a contract on site so that another couple doesn’t book your date. P.S. 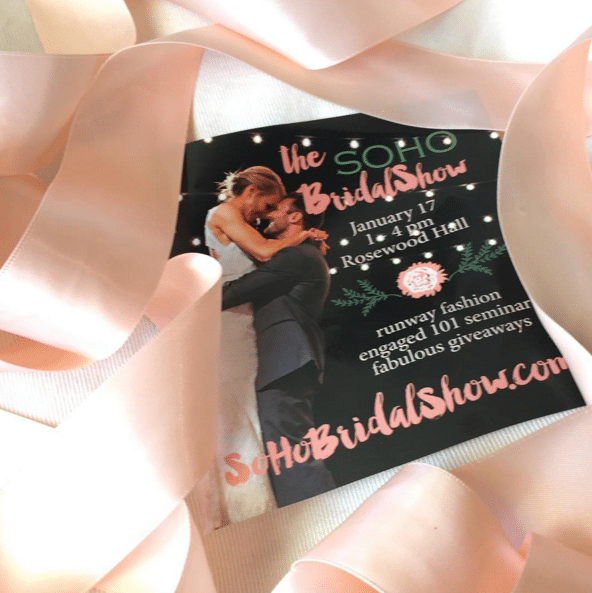 We have FREE tickets to the SoHo Bridal Show on January 17, 2016 – Call or email us and we will send them to you!